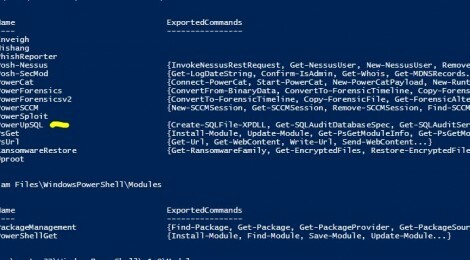 Browse: Home / PowerUpSQL: A PowerShell Toolkit for Attacking SQL Server. The PowerUpSQL module includes functions to support common attack workflows against SQL Server on scale that can be used during internal penetration tests and red team engagements. I’ve also included many functions that could be used by administrators to inventory the SQL Servers on their Active Directory domain. + Scalability: Multi-threading is supported on core functions so they can be executed against many SQL Servers quickly. + Portability: Default .net libraries are used and there are no dependencies on SQLPS or the SMO libraries. Functions have also been designed so they can be run independently. + Flexibility: PowerUpSQL functions support the PowerShell pipeline so they can be used together, and with other scripts. + Easy Server Discovery: Discovery functions can be used to blindly identify local, domain, and non-domain SQL Server instances on scale. + Easy Server Auditing: The Invoke-SQLAudit function can be used to audit for common high impact vulnerabilities and weak configurations using the current login’s privileges. Also, Invoke-SQLDumpInfo can be used to quickly inventory databases, privileges, and other information. These functions are used for identifying weak configurations that can lead to unauthorized access. Invoke-SQLAudit can be used to run all of them at once. These functions are used for maintaining access to the SQL Server using various methods. The roadmap for development is below. I’ve included a few links to standalone scripts that have not been integrated yet. ← Bluto v1.99 – DNS Recon | Brute Forcer | DNS Zone Transfer | DNS Wild Card Checks | DNS Wild Card Brute Forcer | Email Enumeration | Staff Enumeration | Compromised Account Enumeration.